Save Your Time By Sending Pre-Defined Messages To A Pre-Defined Audience. Deliver Urgent Alerts To Your Entire Workforce, Or Just Those Employees Who Are Affected In One Click. WHAT DOES DESKALERTS NOTIFICATION SYSTEM DO? DeskAlerts is a powerful and reliable notification system that can be used for mass notification. During emergency cases, this software serves as an emergency broadcast system announcement that sends emergency messages to everybody thereby reducing the amount of chaos and confusion. As a mass notification system, it sends messages to all the employees regardless of their location or network. They can receive these alerts on their computer monitor or mobile device. It can also be set to send to specific group of people or an individual. Find out who saw your messages and when they saw them. Check survey results. Our user-friendly platform will minimize the time it takes you to send an emergency alert, which is important during time critical incidents. High-priority alerts that appear even if the end user has switched the client to mode or has locked their machine. The high-priority alert will always appear on top of any other pop-up messages. Autoclosing alerts that appear on screen for a given time period and then disappear automatically. Alerts that have a lifetime of when they can be received and when this time period expires they cannot be received anymore and will automatically close if on a user’s screen. In case of emergency one-click alerts can be sent without logging into the system – send them directly from your computer desktop. And if you don’t have access to a computer while an emergency situation is unfolding, notifications can be sent through a separate mobile application. 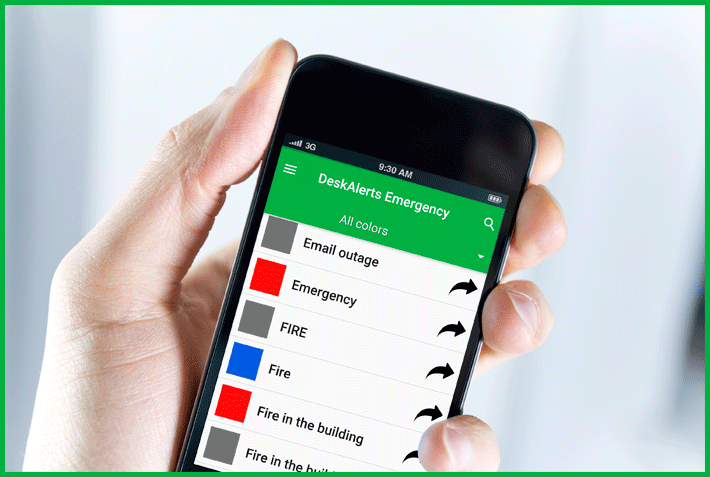 The DeskAlerts emergency notification system gives you control over the process of informing employees. You can control the type of alert you send as well as how often you send it and how it looks. You can send the emergency alerts to your entire workforce, or just those employees who are affected: for example, your office in one particular city, staff who work on a particular floor of an office building. You can customize the emergency notification’s appearance and set the size and position of where the message will display on users’ screens. You can even send as a full-screen alert, which is recommended to grab attention during a crisis. Shortcuts can be configured to send an emergency ticker followed by either a long or short message. (At this stage desktop shortcuts are only available for Windows users, and the emergency alert app is available for Android and iOS). Other channels can be utilized to send emergency alerts including email and as an SMS emergency notification system. DeskAlerts can also provide an app for sending emergency broadcast system alerts to phones and other mobile devices. Send messages that will remove itself from history once the user closes the alert window. Your emergency alerts will be prioritized even if your computer unit is locked, on screensaver mode, or sleeping. It helps you keep noted despite uncontrollable circumstances. Message status reports will be sent to the server with recorded dates. This will allow the server to track messages down to particular users and connected individual devices. The EAS shows senders indicators that will prove that the receivers have read the messages. Automate message sending, send identical messages across the EAS network in customizable intervals in an automated fashion. According to a recent survey by office supply company Staples, around half of employees believe their workplace is unprepared should an emergency situation unfold. Whether you have a fire, a severe weather event, an active shooter or terrorist activity, these situations are both serious and volatile. Getting the information out to everyone in a time-sensitive manner is critical. Traditional forms of company internal communication such as telephone, email and intranet are just not up to the task. Emails might not be seen. Calling everyone takes too much time. With DeskAlerts you can instantly communicate with your entire workforce at the touch of a button. Whether it’s a code black alert in a hospital or if you need to evacuate an entire skyscraper because of a fire, all your employees can be alerted to the situation and given appropriate instructions in a matter of seconds.